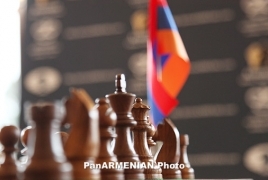 PanARMENIAN.Net - The Armenian men's chess team won't be leaving for Baku to participate in the 42nd Chess Olympiad in the Azerbaijani capital, Aravot cited deputy chairman of the Chess Federation of Armenia, grandmaster Smbat Lputian as saying. According to some sources, the Greek team has no intention of going to Baku either, although FIDE's deputy president Georgios Makropoulous is Greek. The international conference Theoretical and Practical Issues of Chess Education in Schools will be held in Armenia's Tsaghkadzor from September 30 to October 3. The event is organized by the Chess Academy of Armenia and the Ministry of Education and Science.